TMD stands for temporomandibular joint dysfuntion. We have two joints one on each side right in front of our ears. It is the most used joint in our body, being used about 2500-3000 times per day. When dysfunction in this joint happens it can lead to symptoms such as pain or clicking in the actual joint, but also symptoms elsewhere in the body such as headache, neck and ear pain. You can never just look at one area for the cause of a symptom. The body is far too complex. If there is any instability or dysfunction in the lower half of the body, this can cause compensations throughout the entire body and inevitably the TMJ. Additionally, if there is any dysfunction in the cranial bone movement, or the way the dental system functions, this can affect the movement of the TMJ. Stress and hormones can also have an affect on TMJ function. Looking at just the actual joint will never solve the issue. The TMJ is usually just compensating for some dysfunction elsewhere. 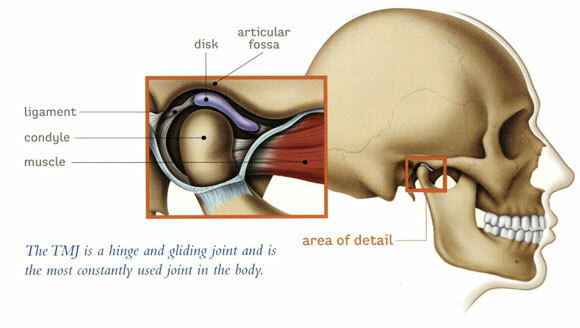 Since temporomandibular dysfunction is so complex, treatment has to be determined based on the source. Treatment can include focus on the pelvis, the cranium, looking at the bite, hormone imbalances, and stress relief (N.E.T). Any dysfunction or weakness in the pelvis is critical for stabilization throughout the body, even the TMJ, because of the inability to bear weight evenly. Treatment is designed to bring balance to this system. If the pelvis is stabilized, then the compensations throughout the spine will decrease. Depending on the patient, stabilization can be achieved in usually a few weeks. Any instability in the pelvis can also pull on the cranial bones since a continuous tissue called the Dura matter connects them. It works similar to a torque mechanism; any dysfunction at either the top or the bottom will have a reciprocal affect. This pulling from the sacrum can create distortions in the cranial bones, which can lead to pain and dysfunction. Going beyond just structure, often times co-management is needed in order to achieve a balanced bite. Working with dentists who understand functional dentistry is key, and may include bite adjustments, and/or construction of an occlusal (bite) splint orthotic to protect the jaw and muscles from clenching/grinding. Sometimes, orthodontics to move teeth to a more balanced position, or prosthetic solutions are needed.